This September, H.B. 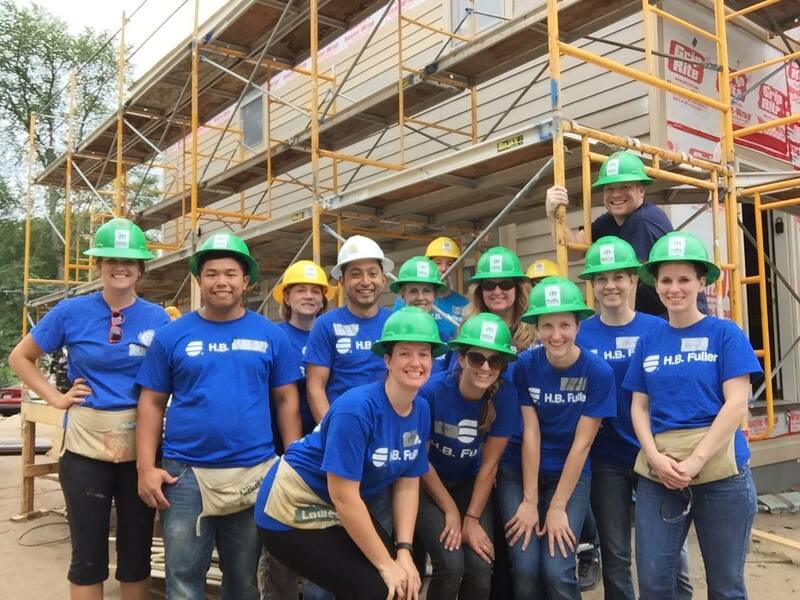 Fuller partnered with Habitat for Humanity to help build an affordable home in Minneapolis, Minnesota, for a local family. Seventy-five employees from H.B. Fuller’s world headquarters in St. Paul, Minnesota, volunteered a total of 525 hours over the course of a week. H.B. Fuller employees were proud to support Habitat for Humanity’s mission of making decent, affordable housing available to hard-working families. Knowing that a deserving family in our community would soon be living in the rooms our employees were building made this volunteer opportunity an especially rewarding experience. Employees were also able to build relationships with their coworkers. Working together to install siding and construct a deck quickly takes teambuilding to the next level! Our week spent with Habitat for Humanity was also a great way to get ready for our upcoming Make a Difference campaign in October, when H.B. Fuller employees around the world donate their time through volunteer projects in the communities where they live and work. Learn more about our commitment to community and our Make a Difference Campaign by following #HBFullerCares on social media or by visiting www.hbfuller.com/community.